University of Maryland University College (UMUC) is a leading public state university with an impressive 65 years track record providing educational opportunities that are affordable, career-focused and globally respected for their excellence. With over 90+ degrees, specializations and certificates, UMUC’s hosts on-campus, online and hybrid classes to help students acquire the skills to professionally excel. It also caters to non-traditional and adult learners with a flexible range of academic programs aligned sharply with workforce demands. – Traditional career fair approaches involving paper-based resume sharing offered students little incentive to participate; the tech savvy millennials needed more exciting job search tools to encourage attendance. – Employers struggled to find desired talent due to time-intensive resume collection, sorting, and data-entry processes. – Recruiters had no digital technology to take notes and shortlist talent on-the-spot in order to accelerate hiring efficiency. decision making amongst recruiters was an obstacle; no tools to build candidate pipelines provided employers with extremely short-term benefits from career fair attendance. – Student and employer interactions were haphazard; high traffic led to recruiters being unable to track the context of conversations exchanged with students. – Engaging students prior to the career fair was difficult; there was no place to digitally upload resumes and research employers expected at the event. – Students had no way to follow up with employers after the career fair; no contact details to connect post event led to an overall disappointing attendee experience. UMUC hosted Spring Break Career Fair 2019 with the objective of helping students land their dream jobs. Also, they wanted to provide employers with an impressive recruitment experience to ensure their campus ranks high as a top talent source. Keeping in mind these goals, ScanShake once again powered an exciting event to ensure active student participation, focused hiring, and a hassle-free user experience for all. Busy schedules meant that attracting students to participate was a significant obstacle for the host. ScanShake removed the overwhelm from the career fair by using the mobile app to transform their job search strategy. Meeting recruiters, submitting resumes, and receiving a digital business card in return to enable stress free follow-ups meant that students were more motivated to attend. Also, the paper-free experience was a huge incentive to network freely (without worrying about running out of resume hard copies). Employers no longer had stacks of resumes taking over their booths. The instant resume capturing based on unique QR codes provided to every student meant effortless candidate pipeline building and searchable talent pools. The database populated from the event could then be exported and shared amongst hiring teams for collaborative shortlisting efforts. Also, all companies enjoyed a branding boost by being listed in the exhibitor roster, in turn also generating increased booth traffic based on clear visibility of their vacancies. Students also felt highly engaged by benefiting from immense time saving, and targeted networking. By being able to select potential employers of their interest from the app’s list, they could visit booths and apply for their desired jobs without having to print dozens of resume beforehand. The digital business cards they received after every QR scan of their profile catered to their paper-free preferences and helped nurture new relationships. Recruiters were empowered with a range of features to expedite hiring decisions. By being able to add notes, searchable tags, and “star” remarkable candidates for instant short listing, employers could instantly make note of outstanding talent on the spot. Moreover, the option to add notes to profiles helped them break free from scribbling on scrap paper, and the stress of forgotten contexts of conversations by the time they returned to their offices. The impact of a career fair relies heavily on delivering an experience that streamlines recruitment, communication and participation for exhibitors and students. The app recorded insights including the scans taking place in real-time, scans per student and employer, majors highly in demand, and other KPIs to determine the career fair’s success. 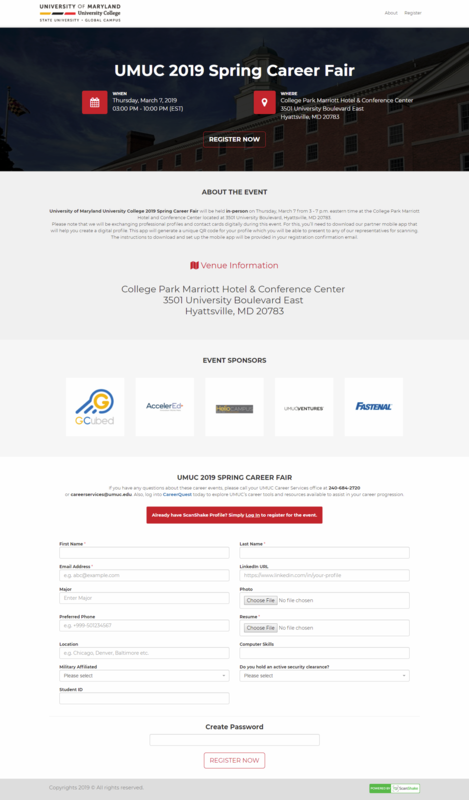 Taking away any need for manual counting and performance assessments, the automated reporting provided reliable data to make future event planning absolutely data-driven. – High Adoption Rates: With total scans at the event exceeding 3100, it was evident that the recruitment technology was welcomed as a refreshing change by all. – Scanning Velocity: The career fair’s scans at peak were recorded to be 15.1 scans/minute, a number indicating high event activity. – Employer Engagement: An impressive majority, 51 out of 58 employers, used the ScanShake app to meet their existing and future hiring needs. – Employer Satisfaction: An average of 60 scans per employer indicated that exhibitors actively used the ScanShake app to adopt the paper free recruitment strategy. 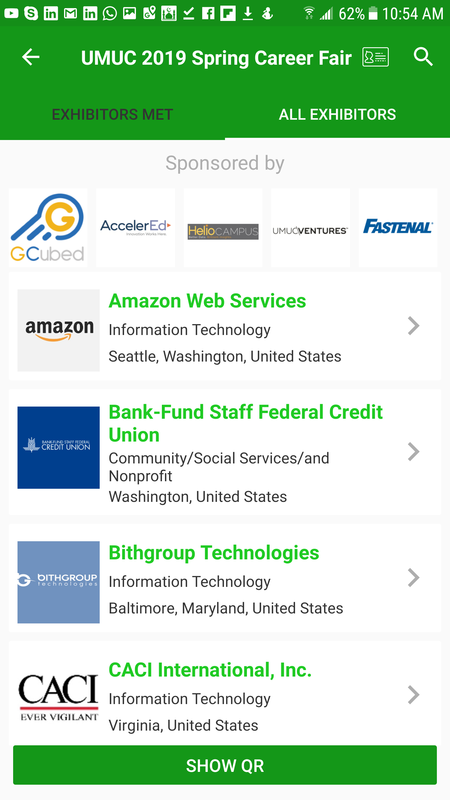 – Employment Trends: Actionable insights gathered from the app highlighted top majors employers favored; Cybersecurity & Networking was a discipline where students were seen most involved. 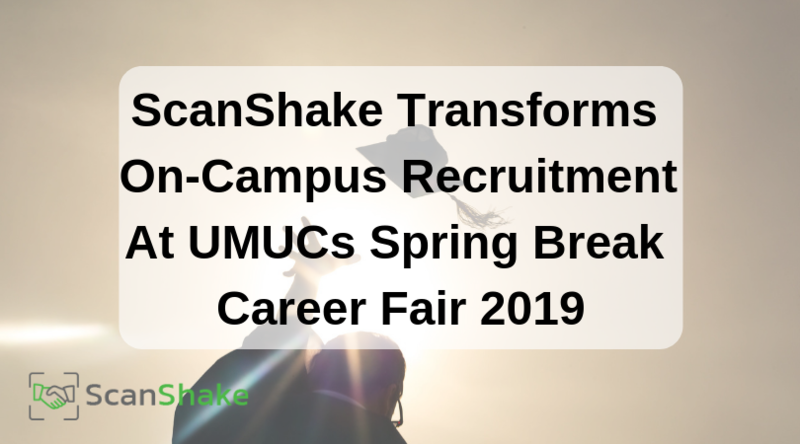 Making candidate sourcing a breeze, ScanShake’s revolutionized career fair hosting for UMUC. Helping boost placements, long-term employer relationships and student attendance- we can’t wait to power more high traffic events that take functionality and user friendliness to the next level.